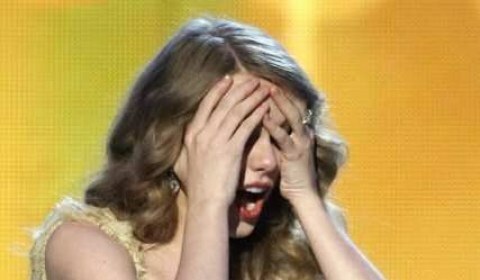 I love Taylor Swift, I mean I’m a Govenor in the Taylor Swift nation, but I think its about time her publicist or cooler older cousin sits her down and tells her to quit doing this face she always makes when she wins an award. You know its that one where she kind of hunches forward a few inches, covers her mouth, and does this sort of “O my gosh, I cant believe I won this… Like, no way, Im the winner. This is so crazy…” body language. regardless of this posture, she deserves the awards that usher in this annoying pose.